The "Stahl" electric hoist with twin lifting hoists are available either foot mounted or built into a trolley. Swl's Ranging between 250 kg to 3,200 kg per hook. 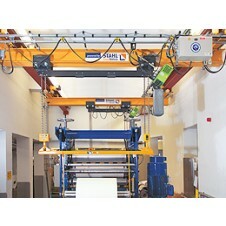 The Stahl Cranes electric hoist with built in "Ultra" low headroom motor trolley. Capacities ranging between 125 kg to 5,000 kg swl. The "Stahl" electric hoist with built in low headroom motor trolley design capacities ranging between 125 kg to 6,300 kg swl. Here at Hoist and Winch Limited, we stock a range of Stahl Electric hoists, perfect for a variety of different lifting applications. The Stahl electric hoist offers one of the most diverse chain hoist combinations on the market, with a varied range of electric chain hoist designs to suit most requirements. 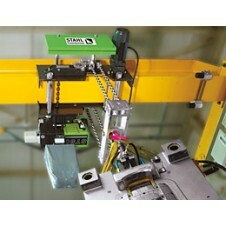 Our range of Stahl models boast electroplated load chains, compact design and low maintenance schedules as standard. We have two Stahl electric chain hoists from the ST series, which rank among the most comprehensive electric chain hoist programmes on offer in the world. With reliability at the forefront of design, we can find the ideal electric chain hoist for your application. With many non-standard options available upon request, such as big bag hoist design, maximum ambient temperatures of + 55°C, geared hoist limits for top and bottom hook positions, offshore paint finish to name but a few, the Stahl electric powered chain hoist is a market leader. Our Stahl electric hoists have capacities ranging from 125kg to 6,300kg swl. If you’re looking for a heavy duty reliable electric chain hoist from a German manufacturer renowned the world over, then look no further than the Stahl range of chain hoists. We offer the complete range of the Stahl Cranes ST series chain hoists which ranks among the most comprehensive electric hoist programmes on offer. We can proudly say that these hoist units are in use in thousands of applications around the world for many decades. 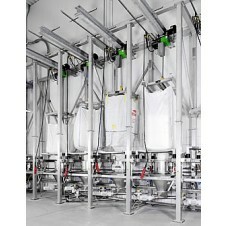 In addition the Stahl R&D department are continually modernising and optimising the ST series. 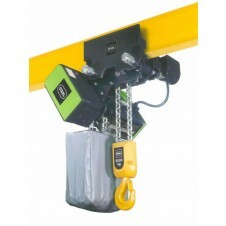 The ST series chain hoist is a true classic. Powerful, reliable and undemanding as far as maintenance and power consumption are concerned. This electric hoist can be supplied for fixed position lifting applications with either suspension hook, eye or with a rigid mounting. Alternatively if a monorail application is called for we can provide the ST electric hoist with either a manual push trolley or electric trolley.